Welcome to Glasgow Tango - introduction, news and events. Glasgow Tango's website has details about regular, weekly Argentine Tango dance classes with Shona and Alistair. There is also information about special workshops with tango maestros Jenny and Ricardo Oria and our free tango tasters. We know that you will want to go out and practice what you have learnt. so we also have news about social events such as our Tango Tea and Valentine's Ball. Advice for new tango dancers with essential do's and don'ts for getting the best out tango can be found on the Questions page. Similarly, addresses and maps of venues can be found on the Find Us page, while Links to other tango organisations and information are also available. The next new beginners course started on 17 April. Places still available until 1 May. Please remember booking is essential for the beginners course as this allows us to balance numbers and avoids disappointment at the door. Email Alistair at info@glasgowtango.org.uk for more information and to reserve a place. Drop-ins are always welcome at Improver and Intermediate level (no booking necessary). Our next Tango Tea will be held on Sunday 28 April, 2.30-5.30 at St Andrews East. Come and enjoy some of the finest cake and tango in the West of Scotland. Tango in Glasgow the website for pretty much everything happening in Glasgow has changed domain names. You can find it at www.tangoglasgow.org. Add it to your favourites list. Subscribe to our calendar and get automatic updates of classes and events. Click the 'Add' button next to 'View Calendar' below the events listing. These classes offer everything the new tango dancer needs to get started. Booking is essential. Classes will usually be at Notre Dame Primary School but look out for changes. There’s more information on out Classes page. 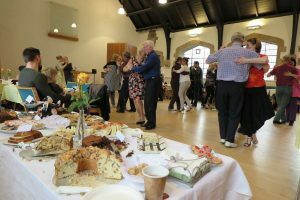 Come and enjoy a relaxed afternoon dancing at one of Glasgow Tango’s most popular events with delicious home made cakes and sandwiches. Everyone is welcome.